There wasn’t much hype surrounding Saturday night’s “The Ultimate Fighter 9 Finale,” however the overall card turned out to be the UFC’s best-ever on Spike TV. By far. Fittingly, no bout was more spectacular than the night’s main event between Diego Sanchez and Clay Guida as the two warriors battled to a controversial split decision. As usual, Sanchez came out fast, staggering Guida just seconds into the scrap. And as usual, Guida went “Rocky Balboa” to survive the last four minutes of the 1stRound. Guida got jacked up early and often, even getting dropped with a head kick later in the opening round. It could be argued that Guida was on the wrong end of a 10-8 round, in fact one of the judges awarded Sanchez the scrap 29-27, meaning Sanchez dominated the opener enough to earn a 2-point benefit in their eyes. The other two judges were a wash as they scored the bout 29-28 each way. Guida came back strong in the 2ndRound as he immediately took Sanchez to the mat. That was where the TUF 1 winner remained for much of the remainder of the round. Although Sanchez held Guida in his full guard, he landed some razor-sharp elbows from the bottom causing massive amounts of blood to pour from Guida’s mug. Guida easily took the middle round, however both fighters came with it to start the final five minutes. Guida got Sanchez on his back in the closing minutes, however wasn’t able to inflict any damage while Sanchez threw one submission attempt after another. The final horn sounded with both fighters on their feet, arms raised convinced they had done enough to have won. It was awesome. In fact, it was so nasty that it was one of three $25,000 Fight of the Night bonuses awarded by the organization. As great as their 15 minute classic was, it ended in controversy as all three judges scored the fight differently, with two on complete opposite ends of the earth. 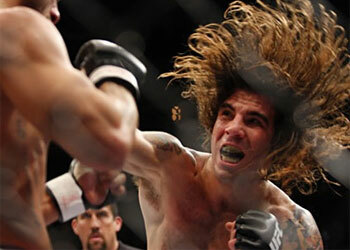 Guida left the Octagon classy in defeat, while Sanchez left focused on UFC gold. I wonder what lightweight top contender Kenny Florian and champ BJ Penn thought of Sanchez’ improved stand-up game?